I must say my parents are very much bangal [a typical identification of Bengali people who migrated from Bangladesh to west Bengal] due to their food choice and cooking habits, but they used to quickly adopt to the good food habits of the ghoti people here after knowing some very important food values like gota sheddho of sheetal shasthi puja. Though there were no ritualistic food culture in our family, but I can still remember how we used to relish gota sheddho in the winter when new and baby vegetables were easily available. My mother used to soak kulotthokalai and green whole mung dal usually on the Saturday nights and our Sunday breakfast comprised of a big bowl of gota sheddho and gola bhat of lal rice [overcooked unpolished rice aoush or gobindo bhog rice] and every time my father used to repeat the story of dhenki chhata chal and it’s flavor. I can still remember because of my unwillingness to go to general washrooms on school days, my mother was so anxious about my health that she used to soak the kulottho ritually on holidays and gave me in the morning to drink in an empty stomach to keep my renal function healthy. Needless to say the rest of the handful of soaked dal was added to the curry or lentil for the meal for that day. In Bengal the Sheetal shashti puja [Sheetal means the cool and shasti means the 6th day] is observed on the 6th day of the Sukla Paksha of Magha month the day after the sukla panchami or Saraswati puja. A special preparation of cooked whole vegetables [usually consisting of five different types of vegetables and 6 number of each] in legumes traditionally called Gota Sheddho is cooked on the day before the puja that is on panchami day (fifth day)in the evening of saraswati puja and the food is served on the next day when it is cooled or sheetal. Hence comes the name. This ritual is mainly observed by the Bengali mothers wishing for a long and healthy life of their children by cooking the best new vegetables. Almost every family has their own version of making gota sheddho, like my mother who could not compromise with the items, which listed a big handful of kulthi with the whole green gram legume [gota mung], jujube [topa kul], drumsticks [sojne danta], white broad bean [sada sheem], baby potato [notun aloo], baby brinjal [choto begun], green tomato [kancha tomato], arbi root [gati kochu], green peas with peel [gota karaishuti] and saindhob labon [sea salt] and it is very common to exchange a bowl of gota sheddho among the neighborhood. Wash and soak legumes in clean and enough water for at least 6 hours before cooking. Do not discard the water. Boil the legumes and add all the vegetables one by one. Vegetables which need more time to cook properly has to be added first. Cook on medium heat for about 20-30 mins. Dal and vegetables should be well-over-it (almost boiled but not completely) cooked but not mushy. Turn off the heat and drizzle 2 tbsp raw mustard oil over it. Horse gram or Kulattha kalai s the poor man’s pulse in India and is consumed as dal or sprouts, Kulattha guda, Kulattha yoosha, and Kulatthadya ghrita. The seeds are generally parched and then boiled. The perennial horsegram (Dolichos uniflorus) is a twining herb grown in India for food and fodder. The original Latin name for horsegram was Dolichos biflorus and the exact synonym for horse-gram is Macrotyloma uniflorum commonly known as Moth bean. Nutritional value (per 100 gm.) 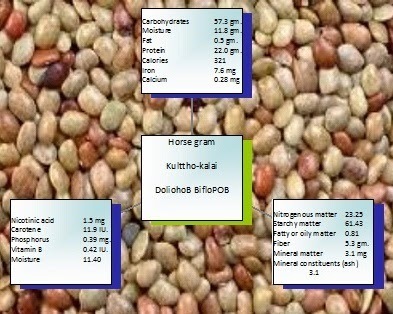 of different nutrient in horse gram. Horse gram contains 0.39% phosphorus, one-third by weight of the ash is phosphoric acid. Kulthi, Hurali, Madras gram, Muthenif, Rahitha, Culutu, hulage, kulithu, habulakulta, Kultha, Rarat, vulavalu, Gaheth, Botang, Kollu, Horse gram contains 0.39% phosphorus, one-third by weight of the ash is phosphoric acid. A soak solution (1.5% NaHCO3 + 0.5% Na 2CO3 + 0.75% citric acid). It also possesses phyto agglutinin, globulin, psoralin and coumestrol in a considerable amount, though like in many other modern age commercially refined and processed food grains the content may be greatly reduced. In a clinical study on 30 cases of urolithiasis, of which 17 cases were having renal calculi and 13 having ureteric calculi, the combination of Svetaparpati with Kulatha Kvatha proved to be effective in relieving pain, burning micturition and showed appreciable lithotriptic and diuretic action. This drug was also found to be highly effective in checking haematuria in cases of urolithiasis and is reported to have good therapeutic value in the treatment of urolithiasis, especially in cases of ureteric calculi. Ref: mpuas_vol.5_pg.123-138. Scientists from the Indian Institute of Chemical Technology have found that unprocessed raw horse gram seeds not only possess anti-hyperglycemic properties but also have qualities which reduce insulin resistance. The scientists made a comparative analysis between horse gram seeds and their sprouts and found that the seeds would have greater beneficial effects on the health of hyperglycemic individuals. The majority of anti-oxidant properties are confined to the seed coat and its removal would not do any good. Raw horse gram seed is rich in polyphenols, flavonoids and proteins, the major anti-oxidants present in fruits and other food materials. The seed has the ability to reduce post-prandial hyperglycemia by slowing down carbohydrate digestion and reduce insulin resistance by inhibiting protein-tyrosine phosphatase 1 beta enzyme. It is an excellent source of iron and molybdenum. There was once a time when people had to be convinced only by ritualistic customs to maintain health issues compared to now where an overrated objective approach has developed in our minds that tend us to justify anything and everything by scientific reasoning. “Oh this is clinically proven” they say and derive satisfaction. The rural people who constitute 70 to 75% of the Indian population live in about 5,76,000 villages located in different agroclimatic conditions. The village people have their own diverse systems of health management. While most of the common ailments were managed in the house by home remedies which included many species and condiments like pepper, ginger, turmeric, coriander, cumins, tamarind, fenugreek , tulsi, etc., more complicated cases were attended by the traditional physicians who used a large number of plants from the ambient vegetations and some products of animal or mineral origin to deal with the local diseases and ailments. In Andhra Pradesh, horse gram or Ulavalu is prescribed for persons suffering from jaundice or water retention, and as part of a weight loss diet. 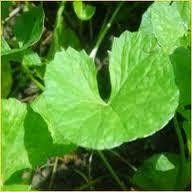 It is considered helpful for rejuvinating iron deficiencies, and also for maintaining body temperature in the winter season. Ulavacharu (Horse gram soup) is a popular dish in Andhra Pradesh, which is served in most of the Telugu speaking people's weddings and ceremonies and tastes wonderful with boiled rice. Pana Sankranti or Chhatua Sankranti is celebrated to mark the first day of the solar month. On this day a small pot with a hole at the bottom filled with 'pana' or sweet drink is hung on a basil [Tulsi] plant. The falling of water from the pot symbolizes the falling of rain and thus this Sankranti marks the commencement of rainy season and of the cultivation cycle. The people of coastal Orissa ceremonially consume the flour of horse gram [chhatua] after offering it to the basil plant. In Kerala, horse gram, Muthira in Malayalam, stir fry horsegram or Muthira Upperi or Kollu Poriyal is used as a home remedy to reduce high blood pressure. In Tamil Nadu, horse gram called Kollu, in the southern districts it is called Kaanam is commonly used in Tamil dishes, including kollu chutney, kollu thoran, kollu porial, kollu avial, kollu sambar, and kollu rasam. In traditional siddha cuisine, horse gram is considered a food with medicinal qualities. In Maharashtra, and specifically the coastal Konkan region and Goa, horse gram (Kulith) is often used to make Kulith Usual, pithla and laddu. It is used to make popular dishes like Kulitan Saaru, Kulitan Upkari, Kulitan Ghassi (coconut curry preparation) and idli like preparation(but not fermented) called Kulitan Sannan. In Karnataka cuisine, huraLi saaru, huraLi is a main ingredient. Hurali is also used in preparation like usali, chutney and Basaaru. In South Canara region of Karnataka, in Tulu it is also called as Kudu. Gahat or Kulath is a major ingredient in the Pahari region of northern India. In Himachal Pradesh, Kulath is used to make Khichdi. In Uttarakhand, it is cooked in a round iron saute pan kadhai to prepare Ras, a favorite of most Kumaonis. In Gharwal region, another more elaborate dish is phanu which is made in a kadhai with roughly ground gahat [previously soaked overnight] boiled over several hours. Towards the end, some finely chopped greens like palak or spinach, rai, tender radish leaves, or coriander leaves if nothing else is available, are added to complete the dish. Served with boiled rice, jhangora [a millet-like grain, used as a staple by poorer Garhwalis only a decade ago and now a prized health-food] or just roti, phanu is a wholesome and nutritious meal. The Bhava Prakasha refers the kulattha [kulathi, dolichos biflorus, horse gram] and some other vegetations under priyangu or a flowering tree under yagnic ausadhis. The ausadhi is not used in the modern context of medicine. Nandikeswara mentioned in The Nandikesa kāsika there are four classes of plants – vanaspati, vrksa, osadhi and virudha. Plants bearing fruits are called Vanaspati. Those having both visible flowers and fruits are called Vrksa. Those that die after their fruits ripen are Ausadhis and the weak plants and shrubs are called Virudha. It is clear from the Susruta samhita that the word ausadhi is used in a dual sense, viz, grains as well as medicine. The medicinal use of horse gram dates back to Charaka and Susrutha samhita [1-2 century BC]. It is referred as kulattha [in sanskrit] in these texts. Acharya Charaka categorized it as a diaphoretic [swedopaga]. In various ayurvedic texts, it is called with different names like – tamra beeja, stiramutra, kaala vrudda, kulittha, shweta beeja, sitetara,anilapaha, kharshana, peetarmudga, aliskandha, surashtaka, tamra vrinta etc. Doshic action: pacifier of vata pitta and kapha doshas. Horse gram : Softly boiled, 25 gm. Take in the Morning and Evening. Can add onion and chilly pieces along with seasoning. Take butter milk and barley for reducing heat generated due to above food. Collect and store rain water before reaching ground in a container other than plastic, distill the water. Add 1/4 teaspoon good turmeric powder to half glass rain water and take early in the morning. Do not take food for one hour. Food to be taken at night for weight reduction: Take old rice, Jowar, old wheat, Moong dal, horse gram, barley seeds in equal proportion. Soak them overnight, dry them in the morning. Add little by little quantity in pan and fry them. Later powder the contents and store. Prepare roti and take them in the nights as food. Stoneless horse gram is washed and cleaned. On the day before soak in water and on the next day, it should be cooked well with the same water. On proper cooking add salt, jaggery, pepper powder and mix well. Add 5 ml ghee, coconut pulp at the end seasoned with curry leaf, asafoetida and cumin seed tempering. This is served when it is warm. It is very tasty and nutritive. This dish is good in chronic cold, cough, urinary disorder etc. Rheumatoid arthritis - soup of horse gram (kulattha yusha) and excess perspiration powder of fried horse gram is rubbed to the body. Urinary calculi - decoction of horse gram or medicated ghee prepared out of horse gram. Amenorrhea/ dysmenorrhoea - to the decoction of horse gram asafoetida is added and given Utricaria – soup of dried raddish and horse gram. Comprising mostly of the oral traditions practiced by the rural villages. Carriers of these traditions are millions of housewives, thousands of traditional birth attendants, bone setters, village practitioners skilled in accupressure, eye treatments, treatment of snake bites and the traditional village physicians/herbal healers, the vaidyas' or the tribal physicians. This stream of inherited traditions are together known as Local Health Traditions (LHT). It represents an autonomous, community supported health management system which efficiently and effectively manage the primary health care of the Indian rural mass. At the second level of traditional health care system is scientific or classical systems of medicine. This comprises of the codified and organized medicinal wisdom with sophisticated theoretical foundations and philosophical explanations expressed in classical texts like ‘Charka Samhita', 'Sushruta samhita', 'Bhela samhita', and hundreds of other treatises including some in the regional languages covering treaties of all branches of medicine and surgery. Systems like Ayurveda, Siddha, Unani, Amchi and Tibetan, etc. are expressions of the same. Ayurveda was taught in the ancient Universities in India and evolved, developed and flourished mostly among the urban centers and thus used to be a refined system of medicine. Beginnings of medicine in India,As in Greece, is found in mythology. According to this realm, medicine and surgery were gifts from the god Indra to Sages Bharadwaja, the patron saint of medicine, and Dhanvantari, the patron saint of surgery. Sage Dhanvatari renounced his royal status as Prince of Kasi [Varanasi] and retired into forest where he dictated his Ayur Veda to Susruta. These two scholars passed on their knowledge to two worthy men, Atreya and Susruta. The earliest records of medical practice in the world began about 600 B.C., with the Sanskrit Treatise of Sages Atreya and Susruta. Pioneers of Medical Education Located on the present Jhelum River, Takshasila [Taxila] was the second ancient school of medicine. Sage Atreya, who is believed to have imbibed the Ayur Veda [science of life] directly from Sage Bharadwaja, headed the medical school in Taxila. His treatise on medicine is contained in 46,500 verses. When Emperor Alexander invaded India in 327 B.C., physicians and surgeons in India were well respected for their knowledge and skill. Some writers say that Aristotle was inspired by Eastern knowledge. Both Sages Atreya and Susruta practiced around 600 B.C., nearly 150 years before Hippocrates. Buddhist folklore indicates the existence of two great schools in India during Vedic period where medicine, astronomy, mathematics and philosophy were taught. East of the River Ganga was city Varanasi [Kasi] where Sage Susruta headed the medical department. Having learned anatomy from Sage Atreya, Susruta points out in his treatise, Susruta Samhita, the differences between his techniques and Atreya's. The treatise on surgery indicates that he was probably the first surgeon to perform a rhinoplasty and ear lobe reconstruction. Another great contributor to the ancient medical system was Sage Charaka, a philosopher, Astronomer and physician in the second century B.C.. As the physician of King Kanishka, Charaka edited and revised the Atreya Samhita. Charaka's contributions, in 120 chapters, deals with the symptoms, diagnosis and treatment of diseases of the heart, chest, abdomen, genital organs and extremities. Charaka's wide range of knowledge was evident from his instructions on building hospitals, maintaining hygienic atmosphere for patients and in details like providing toys for children. A detailed code of medical ethics was already well-evolved in India by 600 B.C. In essence, the code required medical practitioners to lead a life dedicated to caring for the sick and maintaining patient confidentiality. Cultural conducts while treating patients were also presented in detail. Ayurvedic formulations use combinations of a selection of around 1200 species, about 500 of which are commercially traded. Ayurveda uses medicinal plants in various forms, some of which can be gathered only by destructive harvesting: in 30 per cent cases only the roots are used, in another 13 per cent only the bark and it is only in about 16 per cent that the whole plant is used. In other cases, medicines use the fruits, leaves, flowers, rhizome, seeds etc. It is commonly thought that medicinal plants are mainly herbs, but in fact about one-third are trees—this has implications for conservation and management of supplies to the industry. The majority of plants used in ayurveda are procured from the wild, though around 10 per cent are cultivated on private lands.